This technique and recipe is how I make a smooth and fluffy light hummus. It's a big hit every time we have a get-together of between 10 to 15 friends – and of course it's great to have for more cozy get togethers too. To make the 'perfect' hummus, you may adjust the ingredients such as the lemon juice and the amount of garlic to your own personal liking – or the liking of your guests. 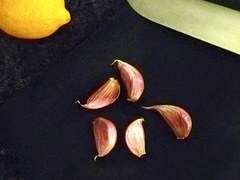 My friend told me, in Israel nobody is afraid of garlic, but I understand that sometimes caution is better. garnish with some dashes of olive oil, sprinkle some paprika powder or few leaves of fresh mint or coriander and/or parsley. The super fast convenient way if time is sparse: use garbanzo beans (chick peas) from a jar or can. Soak the chick peas for 12-24 hours (the day before) in cold water. Rinse them with fresh water once in a while. Simmer them in water on the stove for about 1 hour till soft (or cook them in a pressure cooker to reduce time). Remove the juice to about 2 cups. Lave bean liquid if thinning necessary. What is the secret to this fluffy light hummus? It is very simple: the tahini needs to be blended with the lemon juice separately, before all other ingredients are added to the blender. So if you use a blender the order does the trick: first add the tahini and lemon juice only and run the blender for about a minute or so. You will see how the consistency and color of the tahini changes. After that you can add all other ingredients and finish the blending. Put the tahini a small bowl and while whisking with a fork slowly add some of the lemon juice to it. The tahini will absorb the juice and change its consistency, then add again lemon juice and whisk and repeat till the tahini is smooth, creamy and fluffy. This is the insiders' tip that makes the hummus light and fluffy! Place all in a blender or food processor or use a hand blender. Blend until smooth, add more of the chickpea's cooking water as needed to achieve 'your' perfect consistency. The hummus will get firmer over the next few hours, so I make it slightly more liquid to begin with. Transfer mixture to a serving platter and decorate with some dashes of olive oil and fresh herbs as desired. Serve as a dip with flat breads and vegetable sticks or with a variety of steamed veggies and enjoy in an environment of dear friends.